A COMPLETE REFERENCE BY MARIE-ÉVA DE VILLERS. Request a free 5-day trial For residents of Canada and the United States only. An icon is worth a thousand words! 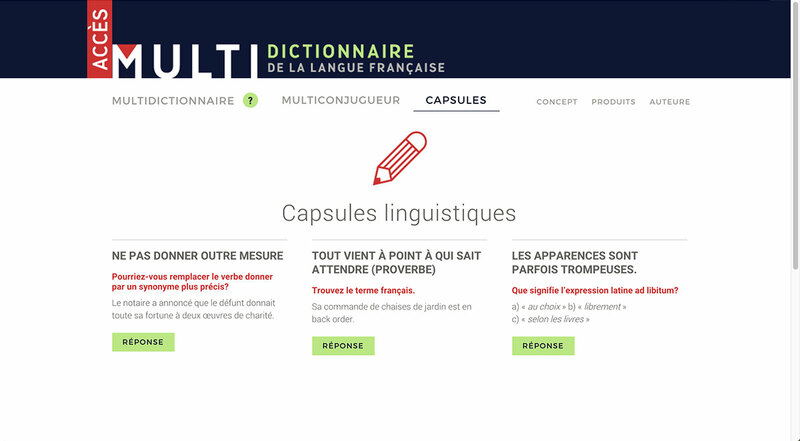 The Multidictionnaire eliminates barriers between various questions by incorporating different types of useful linguistic information within articles, in alphabetical order. In each article, icons indicate the type of note and simplify searches. Difficult-to-pronounce words or words of foreign origin are clearly spelled out and followed by their transcription according to criteria from the International Phonetic Association (IPA). Grammatical notes point out problematic agreements, especially agreement of the past participle of pronominal verbs, choice of auxiliary, and type of noun. Syntactic notes clarify sentence construction, complements, prepositions that go with a particular adjective or verb, and verb tenses. Typographical notes highlight use of upper or lower case, symbols, and abbreviations. Semantic notes point out distinctions in meanings. Orthographic notes point out frequently misspelled words. Preceded by an asterisk, incorrect forms (anglicisms, calques, inaccuracies, etc.) refer you to correct usage. Indicated by a fleur-de-lis icon, Quebec French terms are primarily words for things specific to Quebec, Canada or North America (e.g. acériculteur/maple syrup producer); neologisms designed to avoid borrowing from English (e.g. égoportrait/selfie); words from France that are no longer used by other Francophones (e.g. achalandage/traffic); or necessary borrowings from English (e.g. coroner) and from Native American or Inuit languages (e.g. achigan/bass). Only words, meanings and expressions consistent with correct Quebec usage were retained. 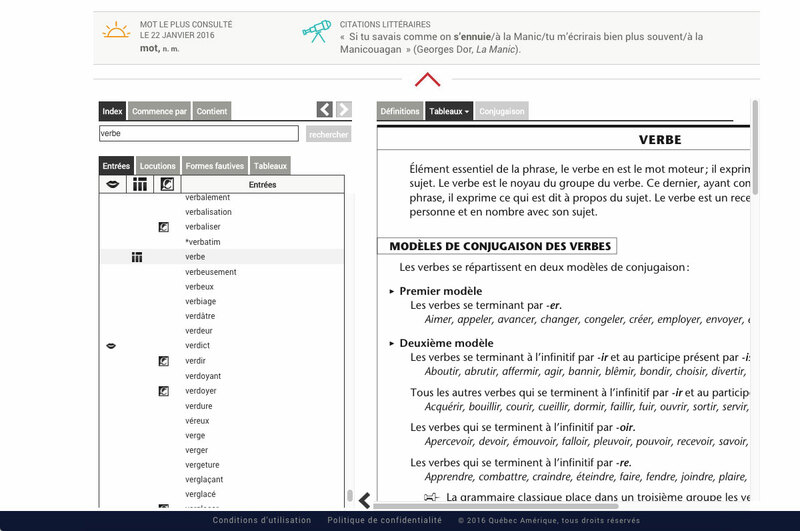 Selection criteria for the words complies with the Énoncé d’une politique linguistique relative aux québécismes (Statement of language policy regarding Quebec French terms) published by the Office de la langue française in 1985. 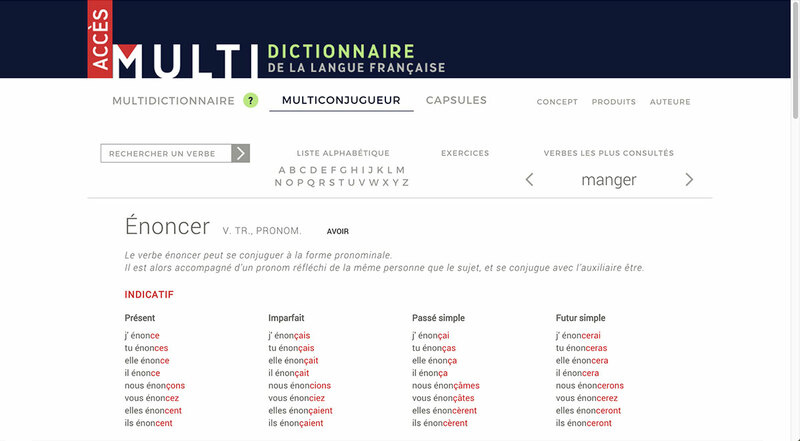 The Multidictionnaire provides the corresponding term used throughout the entire Francophone world, where applicable. 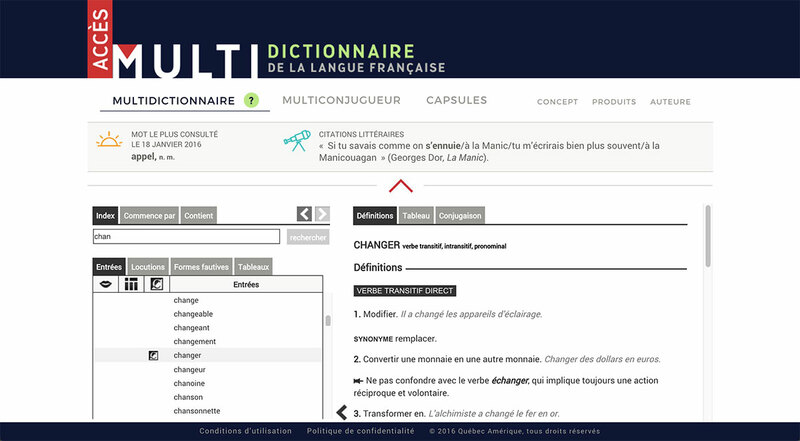 The Multidictionnaire is a versatile dictionary that includes useful information on spelling, grammar, problem areas, conjugation, syntax, anglicisms, typography, Quebec French terms, abbreviations, interfaces between French and English, and relationships, all in a single online tool.